Garnet Jewellery | Great Online Offers from Rocks & Co.
Garnet Jewellery has been popular for some 5000 years. Not only was Garnet (also known as Carbuncle) one of the four Stones given to King Solomon, by none other than God himself, but Garnet necklaces that adorned the royal necks of the Pharos in daily life, were taken along on the trip to the afterlife and entombed with the mummified kings. Garnet was a rare gemstone that was a favourite of nobility and the clergy in the middle-ages. The Bohemian central Europe Garnet deposit discoveries in 1500, made the gem available to every wo/man and marks the surge in the popularity of jewellery encrusted with Garnet. When searching for Garnet in our store, you can create your own Garnet Jewellery set by simply- searching the stone, and subcategorizing to your chosen Garnet jewellery types and quite easily create a set with a ring, earrings and a pendant for example! The colour scheme of the jewels available has grown since the first discovery of the gems. Garnets are now found in green, including - the rare Tsavorite; pink oranges, oranges, saturated purples and even a few blues! Bohemia, the kingdom which later became Czechoslovakia was among other things known for its incredibly deep red Garnets and the jewels produced with them. These garnets were also used in the stunning Victorian style of jewellery design, which often used ornate flower motifs. Antique pieces are often available at auctions, antique stores and copies are reproduced. Many designers are creating 'vintage-style' pieces that pay tribute to the era. One of the trademark designs is the flower halo with a centre stone, with a row or more of smaller stones encircling it. From Garnet Jewellery to ornate statement pieces, we are in an age where you can shop for treasures, or treasure hunt if you will, online! The question often is one of authenticity. 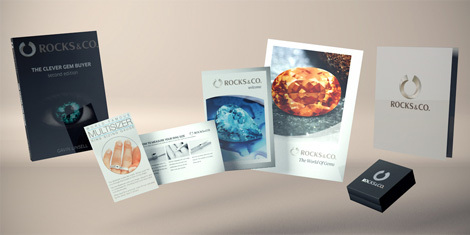 At Rocks & Co. we guarantee that our beautifully created jewellery is produced exclusively using genuine Garnet gemstones and back it up with certificates of authenticity and over 15 years in the gemstone jewellery, TV shopping and e-commerce business. So, relax, grab a smoothie and let's get shopping for some gorgeous jewellery online that you know you can trust. Get your January baby some Garnet Jewels! Why? Because Garnet is the birthstone for January’s people. February's stone is Amethyst, Aquamarine for those born in March, April gets the Diamond, May, the royal Emerald, June babies get to choose between Pearl, Alexandrite and Moonstone, July kids nab the divine Ruby, August's birthstones stones are - Peridot, Sardonyx & Spinel, September kids get to have Sapphire, October's children-Opal and Tourmaline, November babes get Topaz and Citrine, and finally December kids - choose between Tanzanite, Zircon and Turquoise. Contemporary designers are fascinated by Garnet. For example, there are three types of red Garnet; Almandine Garnet - which appears the darkest of the three, Pyrope Garnet - which is likened to Ruby and Rhodolite Garnet. Rhodolite appears purplish red or reddish purple. High-end Rhodolite is said to be have most value out of all of the reds. All are simply gorgeous when the set in jewellery of Sterling silver, and Gold. Fancy a red Garnet necklace? Try a round bead Mala necklace resting on your collarbone, or a simple gold or silver chain with a Garnet pendant just above your heart, a charm necklace featuring more than one pendant for luck and good wishes. These all fall into the category of Garnet necklaces. But that is only the beginning, there are the ornate vintage style settings, the contemporary and modern styles, and the classically beautiful styles like the 'tennis necklace' where same sized stones are set elegantly in a row linked by sterling silver or gold prong settings. In addition the undeniably beautiful deep red Garnet necklaces, Garnet is available in many more colours, increasing the options for your Garnet necklace dreams. Garnet bracelets come in many forms. The round bead Mala bracelet is very popular among the young folk and Yoga set. Usually strung on a simple chord and often featuring a hanging decorative tassel. There are the ornate east Indian inspired styles of jewellery including bracelets, round bangles, charm bracelets, the tennis style bracelet and more, which all can feature the colourful Garnet as its star gemstone. Here at Rocks 6 Co. you can find Garnet bracelets in many these categories and more featuring gems set with precious metals of Silver and Gold. Find the finest Garnet rings set in yellow, white or rose gold – with designs from the most classic to the ornate. On offer are rings created using Mozambique Red Garnet; Orange Garnet, Malaya Garnet, Hessonite Garnet, Green Garnet, such as Tsavorite Garnet & Ambanja Gemstone. Our Genuine jewellery with Garnet is sold at prices directly from the manufacturer, our factory in Thailand, with no middlemen. Our jewellery comes with a certificate of authenticity and guaranteed without nickel.